Yesterday was stressful. Between work and health issues with my beloved kitty I was so happy when the hubby and I met up with Sarah at the Temple. As per the Tuesday night custom I brought along a bottle from my home stash. 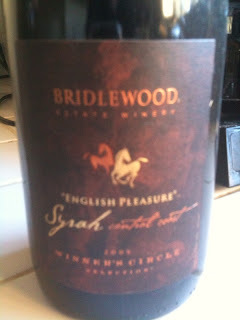 For last night's enjoyment it was a bottle of Bridlewood Estate '06 Syrah English Pleasure. Bridlewood makes some very nice Syrah for their "Winner's Circle" label and in my opinion English Pleasure is the smoothest and most easy going of the bunch. From the opening of the bottle releasing lovely aromas until the end of the medium-length finish one word comes to mind, smooth. This isn't a big, powerful Syrah but is more like well-worn leather, supple and form fitting. The nose is rather floral with rose petals equaling the dark cherry that greets you when you pop the cork. There is a little support from hints of spice and cedar that are simply warm and pleasant (perfect for a chilly evening in San Diego). Good fruit, decent acidity and just enough smooth tannins come together to create a medium-bodied experience that brought a relaxing end to a hectic day. I like how you mention the decent acidity. I find many wines very acidity and therefore I never can enjoy wine like many other people do. When I say out loud people look at me strange. Thanks for the comment and the well-wishes for Romeo (my kitty). I like acidity, but like anything what makes a wine for me is balance. Wines with good fruit can be too flabby if there isn't enough acid to support the fruit (and tannins in reds), but you can have too much where the wine is either too sharp (racy?) for what I think is appropriate. Brander 2008 Sauvignon Blanc "Purisima Mountain"